apparently, i’m terrible at doing baby updates. even though i certainly have no shortage of annabel-related content on this blog, i actually haven’t written an obligatory monthly update since three months. and obviously much has changed since then — as in, pretty much everything. the problem is that i’ve built up the ‘monthly’ posts in my head as posts that have to be super descriptive and all-encompassing . . . and then i end up just not writing them at all! this is a shame since a) i love reading these posts by others and b) i want to have these details to look back on. and yet already, memories are getting blurry. development: the past few weeks have been so much fun from a developmental standpoint! a doesn’t just observe her world now — she LIVES in it and loves the interaction. 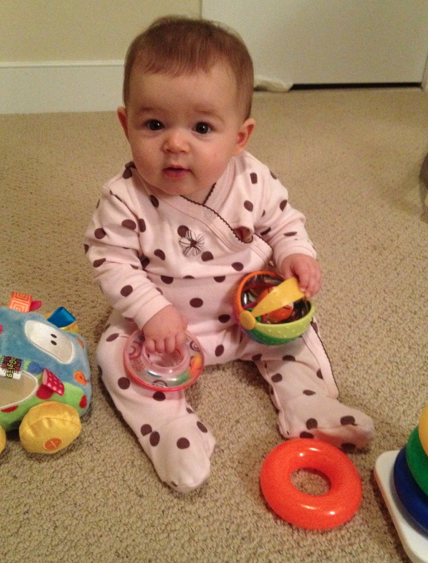 she loves toys of all kinds — although often she will be most interested in the manufacturing label, which seems to be perfect for her to practice her pincer grasp! she’s been sitting since 5.5 months, and it is definitely her favorite position. we’re in this sweet spot where she can sit upright and entertain herself for some time, but she can’t really go anywhere. she’s actually just now starting to seem interested in trying to move/crawl, though she can’t get anywhere yet [she just turns around in circles!]. she’s also just starting to seem more purposeful about the sounds she is making. “bah, bah, bah” seems to come out whenever she’s excited about anything and she will start babbling when i prompt her by making my own ‘bah’ sounds. this is a new development as of a couple of days ago, and is so freaking cute. personality: a has a sunny disposition and starts every morning with a smile. seriously, it’s inspiring! she rarely gets fussy unless there’s a clear reason — usually hunger or fatigue [i don’t even think she cares about wet/dirty diapers!]. it is usually pretty easy to make her laugh — which is pretty much the best sound ever. 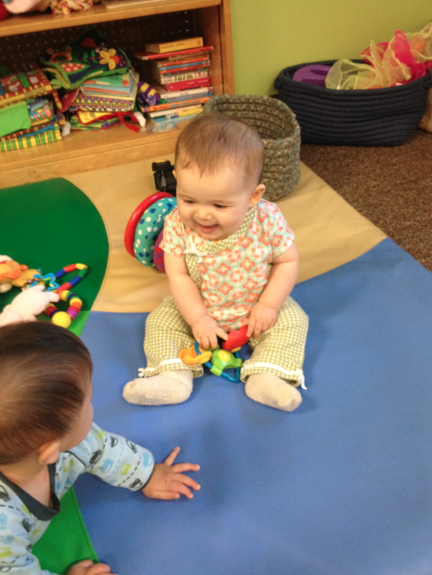 she seems to be very social and loves to smile at others, and she really likes other babies. eating: this girl can EAT. seriously! she is actually pretty neat and efficient about it, too, except when at the end of the meal she will start smearing everything around her face with her hand. it’s a clear signal that she’s done — can’t wait until she can just say so! but we follow dinner with a bath, so it works out. a breastfeeds 3 times daily and also takes 3 x 5 oz bottles at day care. believe it or not despite all my insanity i still haven’t finished my stash, so it’s still all breast milk. i do pump 2-3 oz less daily than she eats so it will happen eventually, but we seem to be holding steady here. and i have a container of formula so that when the day comes i can easily make the transition – i plan on just making a few oz at a time and using them to ‘top off’ bottles of 80% breast milk. but again, not there yet. perhaps i underestimated the freezer stash. she also enjoys 3 meals! i’ve been making all of her food, and it’s been easy. she has tried: apples, peas, pears, avocado, banana, sweet potato, butternut squash, broccoli [mixed with squash], carrots, rice cereal [stopped due to arsenic concerns . . . oh well], oatmeal, plain yogurt [i use yo baby] and most recently a chicken/sweet potato/apple purée. she hasn’t turned anything down yet, but her favorites are yogurt and avocado. i typically pack 2 things for day care [today was pears + cereal] and then give her a big combo meal at dinnertime [in attempt to tank her up for the night!]. tonight, she had the chicken mix + mashed avocado. she also doesn’t nap super-well. at day care, she often has very short naps. i honestly think the environment is just too distracting for her, but really i can’t do much about it! she still seems very happy so i don’t worry about it too much. at home, she’ll take 2-3 naps most weekend days. the first one is usually her best, 1 – 1.5 hours. the other two are hit or miss. ♥ height/weight: a is a shortie at 24.5 inches — the 5th percentile. one might think to blame me, but i was actually a super big and long baby [think 90%!]. she’s 30% for weight — 15 lbs 6 oz at her 6 month visit. 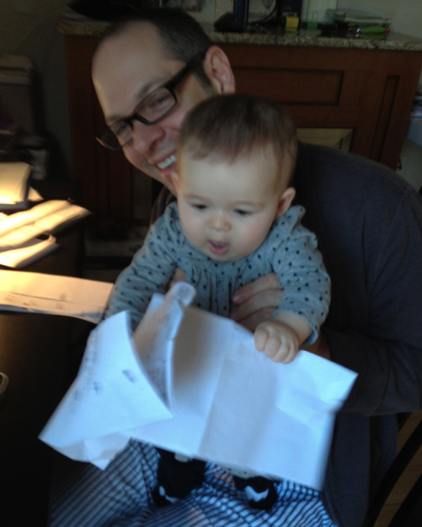 and her head is the biggest part of her at 50th percentile! 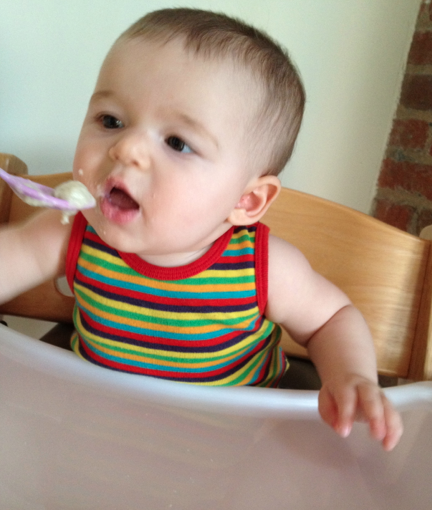 ♥ clothing: still mostly in 3-6 month size, especially at baby gap, which tends to run big [my fave]. ♥ diapers: size 2. but i’ve just bought my first case of 3! ♥ hair: seems relatively straight so far, and light-ish brown. definitely lighter than when she was a tiny baby. ♥ eyes: appear brownish in some light, greenish to gray in others. i think they will be brown [or hazel-ish] in the end but the transition is so pretty! ♥ not really a fan of: naps, when she finishes her yogurt and there is no more! Smiles first thing in the morning are the BEST!! Love that. Also – A is giving you a GREAT stretch of sleep. That is amazing!! 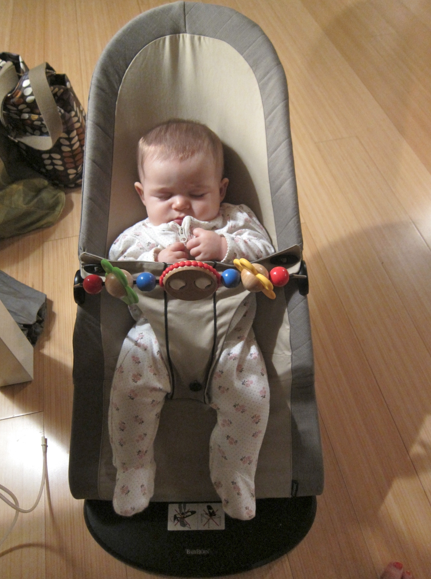 Clara is still hit or miss at night, sigh, but is a great napper during the day. Go figure. She really is SUCH a happy baby! Also, I am still amazed that she can be hit or miss on naps and it doesnt affect her night sleep. Love the photos. Just watch when you start mixing formula with BM or using only formula – daycare will have different rules on how feed & store that than straight GM. Like whatever they don’t finish of a formula bottle is thrown out after an hour. ha, a has NEVER not finished a bottle 🙂 so at least thus far i won’t have to worry about this 🙂 but i will definitely look into their policies! Very cute! Makes me so excited to have my own baby and watch him grow. 2 more months! Adorable post! Love reading these updates too. And I need to do Luke’s 6month post too!!!! Curious why you say you "still haven’t sleep trained." Do you think you need to? 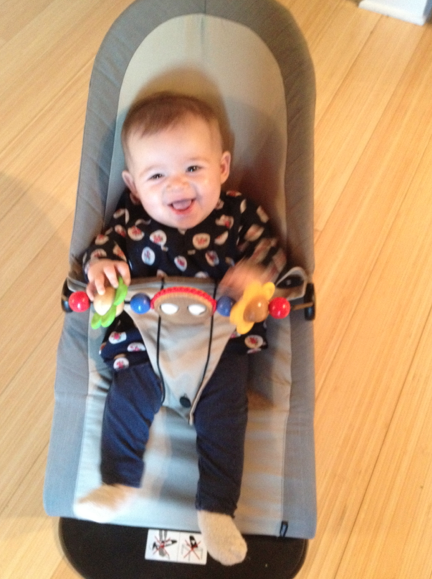 Her schedule of a pretty early bedtime and one wake-up seems pretty great for a baby her age! She is adorable! Soak it up. Lately I have been thinking about what it was like when i just had ny one little girl. Definitely wish I had taken more time to appreciate how easy it was and just enjoy all of the baby stuff. i guess because my pediatrician encouraged us to do it! she feels like a shouldn’t need a middle-of-the-night feeding — NOT counting 5:15 am as middle of the night but she will sometimes still get up at 1am or 2 and not always make it until 6 after that. i agree seeing my friends with multiple kids makes me realize how EASY i have it comparatively! i do think i’m doing a lot of soaking it up though 🙂 even with the occasional stressors [feeding, sleeping, etc] i love love LOVE this time with her. i look forward to every day. Dyls has slept poorly at daycare as well. Though this week on 4 of the days she took 2 90-120 minute naps each! So perhaps we’re turning a corner? It’s only taken us 6 months for that to happen! Maybe A will be the same way. In any case, not much to do about it, so no point in stressing, as you said.